I was batting around a lot of cupcake ideas this week and asking for input. All I knew was that I was wanted to do a meringue frosting. The Red Hots idea came from a coworker – Red Hots and a flaming top of whipped frosting were definitely a match. I was sold. 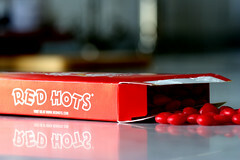 Red Hots themselves offer no nutritional value, basically corn syrup and artificial flavors, but then those flavors are so simple – cinnamon and chili. It seemed easy enough to mimic the flavor in a very natural and tasty cupcake. My first try was somewhat successful. There is a “foodiness” to the cupcake that distracts from the flavors somewhat, but topping the cake with a red hot infused frosting was just the trick in making the statement I intended. The cake has a light, airy texture, is not too sweet, and has an interesting crunch from the chili powder. The frosting is sticky and sweet with a definite red hot flavor. Together they make a nice combination with the end result being sweet but not over powering. 1. Sift flour, sugar, salt, baking powder, cinnamon, and chili powder into the bowl of a standing mixer. 2. In a medium bowl, combine oil, egg yolks, and water. Stir to combine. 3. On a low setting, start to beat the dry mixture and slowly add the wet. 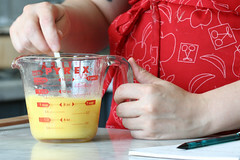 Increase the mixer speed to high and beat until the mixture is incorporated. 8. 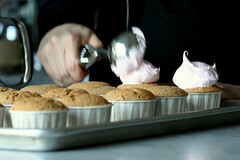 Scoop into cupcake cups about 2/3s full and bake at 350 F for 15-20 minutes or until a toothpick comes out clean. Note: I prefer the taste of ancho chili powder, but by all means, feel free to swap out with your favorite chili powder or powders. 4. Add ground up red hots. 5. Beat on high speed until stiff glossy peaks form, about 5 to 10 minutes more. Note: I ground up the red hots in a small food processor for about 30 seconds. It was partially a fine powder and partially small chunks. I liked the variety. It turned the frosting pink and added a nice crunch. 1. Scoop a good sized mound of frosting with an ice cream scooper onto each cupcake. 2. 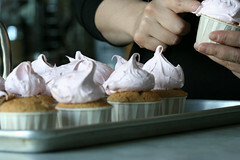 Using a clean finger, smooth frosting down and over the edges of the cupcake and into a round shape. 3. Using a clean finger, poke out some spikes onto each cupcake. 4. Lightly brown with a culinary torch for an added touch. 5. Top each cupcake with a red hot candy. Brilliant idea for a cupcake! OOO! I want to sing the Heat Miser tune from A Year Without a Santa Claus while eating these… as always, fabulous! WOW,, Thank you for this recipe. It sounds wonderful. I will be making these this week. I would never have thought of using Red Hots like that before. Keep your ingenious ideas coming. Ooh, could a lemonhead cupcake be in the future? I loved using chili with chocolate but never thought of using a “vanilla” cake. I love that there are red hots in the icing! Wow! Your creativity knows no bounds! I’d just been imagining a cupcake like this and here is the recipe! I love your brand new flavors! If you do a lemonhead cupcake, I’ll be in heaven. My sister was addicted to red hots when we were kids, so I’ll have to send her the link. Wow. I just found your blog while looking up recipes using green tea. I cannot believe how detailed and gorgeous these cupcakes turn out in your photos! All the work, time, and money you put into doing these is really inspiring. I found your flickr account and I can’t stop looking at the gorgeous photos you took. Love love love all the unique things you’ve done and I can’t wait to try out the green tea recipe!! Needless to say I’ve subscribed to everything I can find on your cupcakes. These look amazing – like mini baked Alaskas. That is on my list of things to try one of these days. 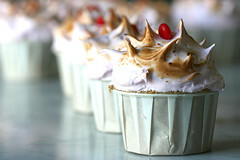 Have you ever considered baked Alaska cupcakes? I want a shot of that frosting! So, what ahppens if you just use allpurpose flour and not cake flour? Is it really worth buying another bag of flour for that 1/2 cup? absolutely inspired-amazing array of cup cake receipes, perfect pictures and so much to learn! 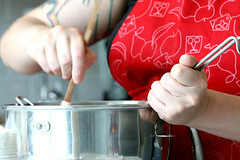 i want to start baking guided by your blogs. i didn’t find a list of must haves on your FAQs. please post a list of tools and other paraphrenalia for a beginner. mucho gracias! The meringue frosting recipe is amazing! I can’t have butter, milk or egg yolks, so this was the perfect frosting for my easter cupcakes I made yesterday! Thank you! It tastes great! Have just been given the link to your website after waxing lyrical about knitted cupcakes in my podcast. I am *amazed* and really pleased to have found it. Will be coming back again for more eye candy! I have to tell you that I really don’t like Red Hots, but I love the idea of using them in the meringue. I’m a sucker for chili-infused sweets, and I am totally inspired by this recipe (and pretty much all of the recipes I’ve come across in your site). I would also like to know about cake flour. Does it really make a difference when you are bakeing or can you just use regular flour. And if it does make a differece, where can you find cake flour because unfortunatly, the supermarket doest carry it. Cake flour will change the texture of the end product (makes it lighter), but it is normally quite safe to substitute all-purpose for cake. While the end result will be slightly different than intended by the recipe writer, it should still be successful. I love these cup cakes. I have never seen anything like it on cup cake. My sister is getting married, i would like to make cupcakes for her wedding. How many days prior to the wedding can I start making the cupcake? I don’t want it to be spoilt on the day of the reception. Assuming 1) you have some time the day of 2) work full time and 3) the wedding is on Saturday, I would recommend the following working backwards. 4) Weekend before – depending on the decorations, prepare them a week in advance or else at some other point during the week. I think baking 2-3 days before is fine. I think preparing frostings and fillings 1-2 days before is fine. Frost and decorate the day off if possible. This is what I normally do. Holy Cupcakes! First time visitor, here. Lifelong Follower and Believer, Im afraid. This is quite possibly the best blog in the entire universe. I am so making the Green Tea Bubble yum yums. I hope they turn out as beautiful as yours did. Your inventive cupcake combinations never cease to amaze me. I just want to make them all! This receipe looks great, I will try it out this weekend. However, can you tell me where I can purchase cupcake liners as I’m starting a cupcake business! I’m having a tough time finding pink and brown. Wow these look soo good! i have added these to my baking bucket list to make for my blog! THANKS!